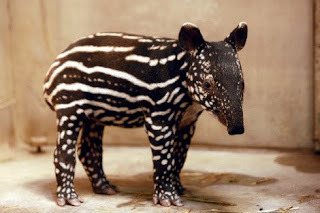 Briefly noted: at Jerry Coyne's blog a guest blogger writes "We can thus see that all baby tapirs look much alike, and quite different from adults. " Yes, well all baby humans no doubt look the same to tapirs. This little guy is no doubt very special looking...to his mom.